The lifespan of active posts on this blog was always going to be limited by the “real-time” nature of the original posts. Almost 5 years have past since this site was updated regularly, although I have posted if any significant new information came to light. The site continues to get a good number of hits, and the odd enquiry or request for information from people researching their ancestors’ roles in the war. 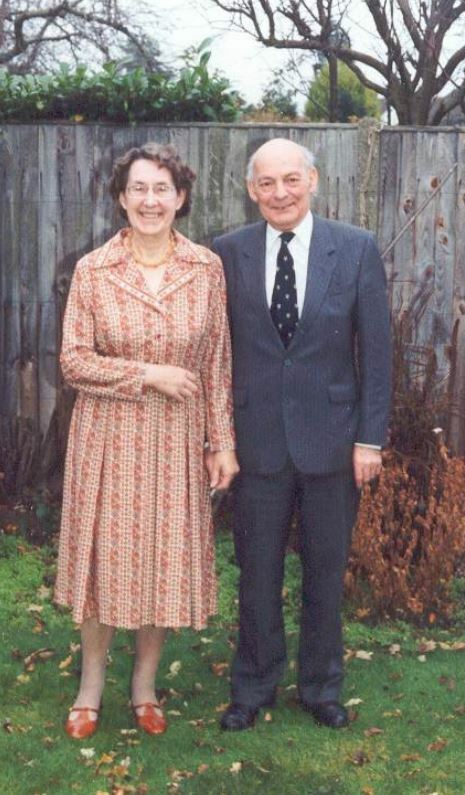 I hope to be able to add some new Aircrew Biographies in the future, but it is a slow process and only made possible by family members or other researchers providing me with additional information. I will always share, free of charge and without expectation, any information I have that will help others with their research. If anyone has any information they would like to share; or has any suggestions as to how I could bring this site back to life without detracting from it’s original purpose, I’d love to hear from you. 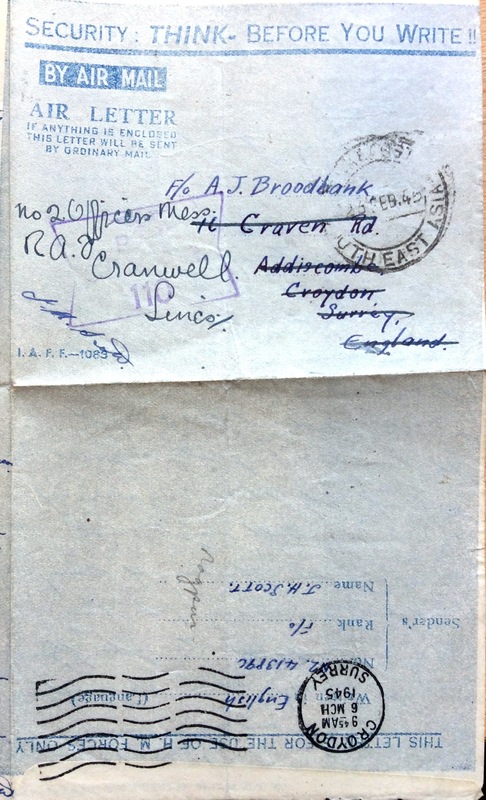 On 04/v/44, 488(NZ) Squadron moved from RAF Bradwell Bay to RAF Zeals. This move was covered in earlier posts, but I have just found an aerial photo of RAF Zeals dating from March 1944, only weeks before 488(NZ) Squadron arrived. As a reminder, RAF Zeals is at Grid Reference ST 78018 32945, between the villages of Stourton and Mere, just off the A303. 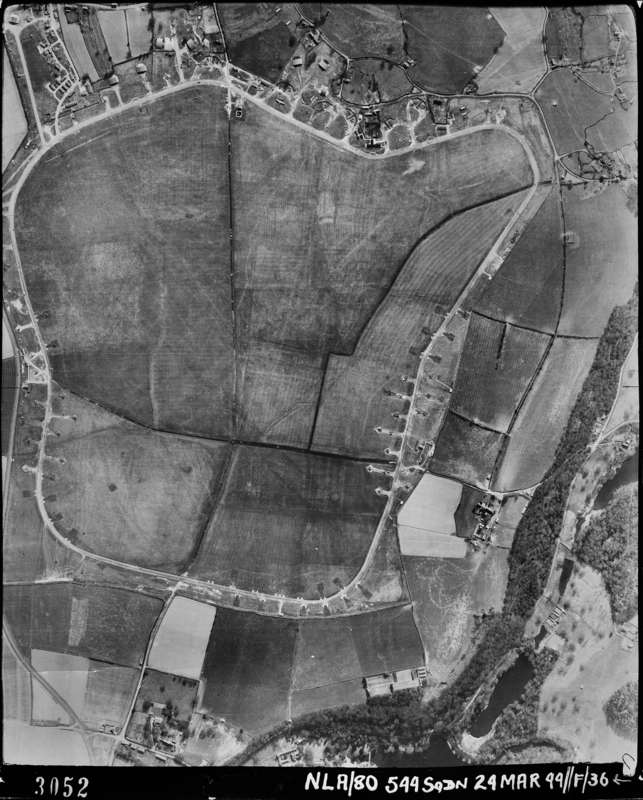 The photograph below shows how the airfield looked on 24/iv/44. Not much remains of the airfield today – it has returned to agricultural use – apart from the old control tower which has been converted into a private residence. 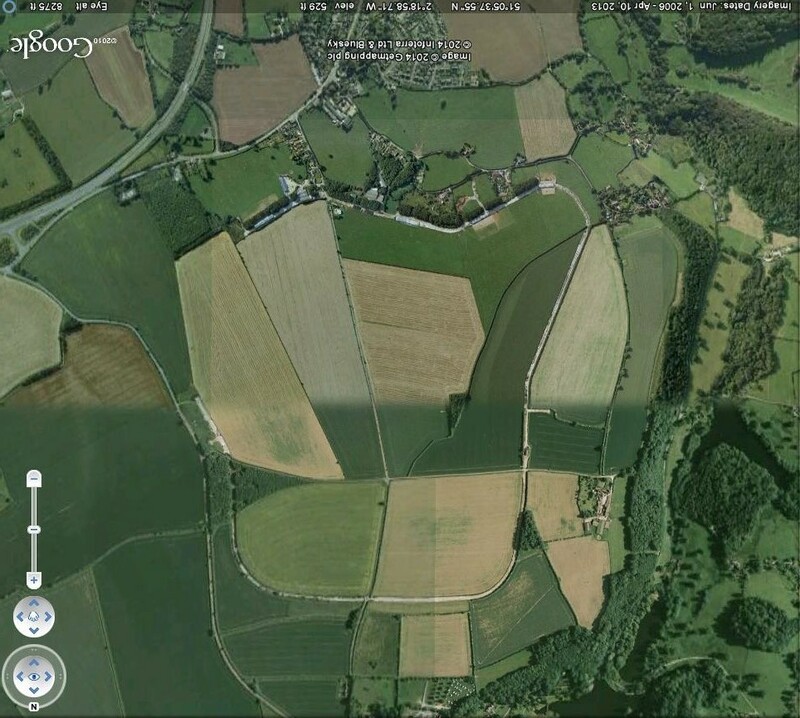 Please note that as the 1944 image was taken from an almost southerly aspect, I have also rotated the Google Earth image for better comparison. Today, I have decided to let you see the journal entry in Broody’s own hand. 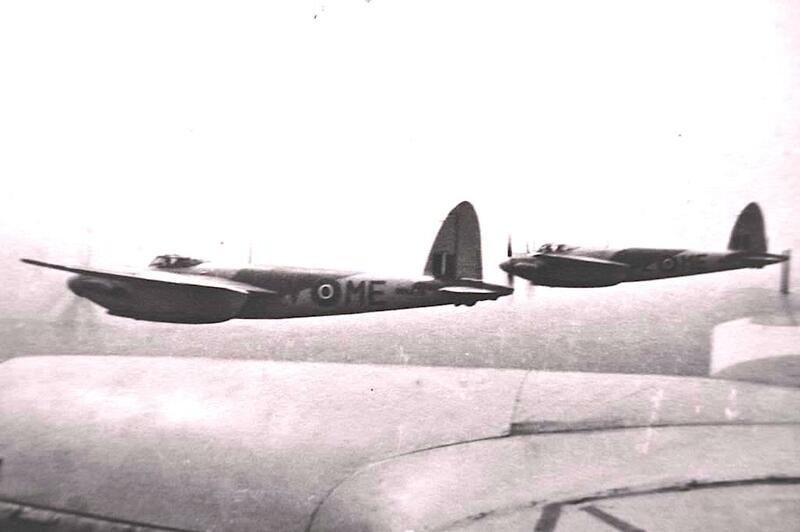 A round trip to RAF Levesden, where de Havilland Mosquitos were assembled, to collect some spares. Of note firstly is the account of the 1st Airbourne Division’s flight to Arnhem on their way to one of the most famous European battles of World War 2. 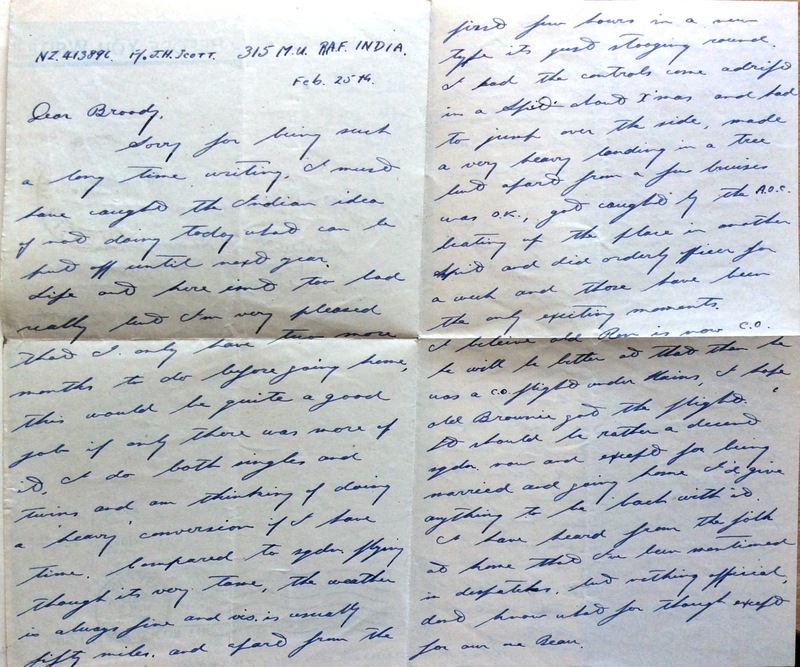 Most poignantly, the final sentence reads simply: “The last flight with F/O Scott” – 6 words to record the end of a partnership which lasted almost the entire duration of Broody’s tour with the Squadron. 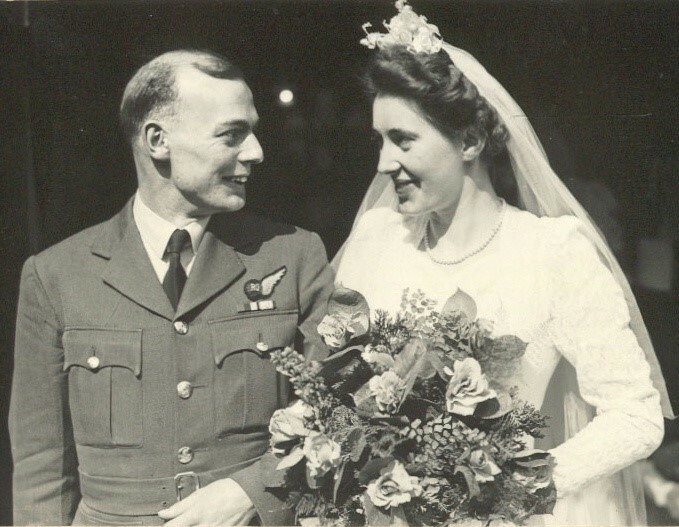 In all, Broody and Jack flew together on 228 occasions, with flight times ranging from 5 minutes (take off and landing on identifying an A/C fault) to 3 hours and 55 minutes on a Patrol. Their time in the air together as Pilot and Navigator comes just 20 minutes short of 295 hours. That equates to over 12 days of flying time! 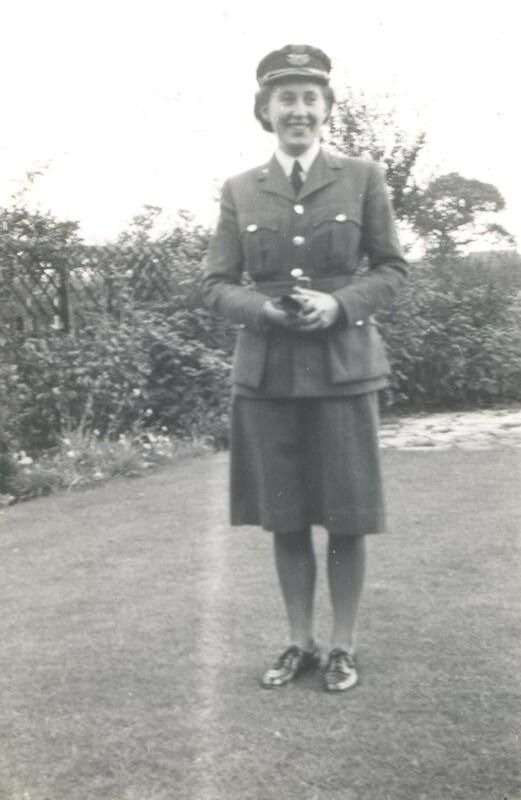 Jack left the Squadron on 19/ix/44 to join 315 Maintenance Unit in India. As I have said before, I think he and Broody lost touch after the war – The world was a much bigger place in 1945 before the Internet. The only record I have of any contact between them after September 1944 is a “bluey” from Jack to Broody dated February 1945. It is an interesting read, and I do not think either of them would mind if I shared it here. 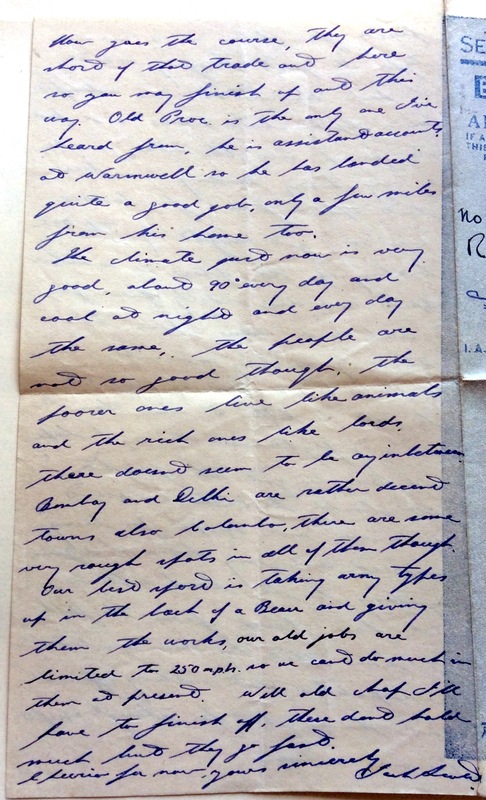 I have transcribed the letter below the scanned images. Sorry for being such a long time writing. I must have caught the Indian idea of not doing today what can be put off until next year. Life out here isn’t too bad really but I’m very pleased that I only have two more months to do before going home. This would be quite a good job if only there was more of it. I do both singles and twins and am thinking of doing a “heavy” conversion if I have time. Compared to sqdn flying though its very tame. The weather is always fine and vis is usually fifty miles, and apart from the first few hours in a new type its just stooging around. I had the controls come adrift in a spit about Xmas and had to jump over the side, made a very heavy landing in a tree but apart from a few bruises was ok. Got caught by the AOC beating up the place in another Spit and did orderly officer for a week and those have been the only exciting moments. I believe old Ron is now CO. He will be better at that than he was a CO flight under Haines. I hope old Brownie got the flight. It should be rather a decent squadron now and except for being married and going home I’d give anything to be back with it. I have heard from the folk at home that I’ve been mentioned in despatches, but nothing official. Don’t know what for though except for our one Beau. How goes the course. They are short of that trade out here so you may finish up out this way. Old Proc is the only one I’ve heard from. He is assistant accounts at Warmwell so he has landed quite a good job, only a few miles from his home too. The climate just now is very good, about 90 every day and cool at night and every day the same. The people are not so good though. The poorer ones live like animals and the rich ones like lords. There doesn’t seem to be any inbetween. Bombay and Delhi are rather decent towns and Colombo. There are some very rough spots in all of them though. Our best sport is taking up army types in the back of a Beau and giving them the works. Our old jobs are limited to 250 mph so we can’t do much in them at present. Well old chap I’ll have to finish off. These don’t hold much but they go fast. Cheerio for now. For state with B Flt. Testing with F/O Jeffs in very bumpy weather. During his tour, Broody flew in 22 of the Squadron’s de Havilland Mosquitos. 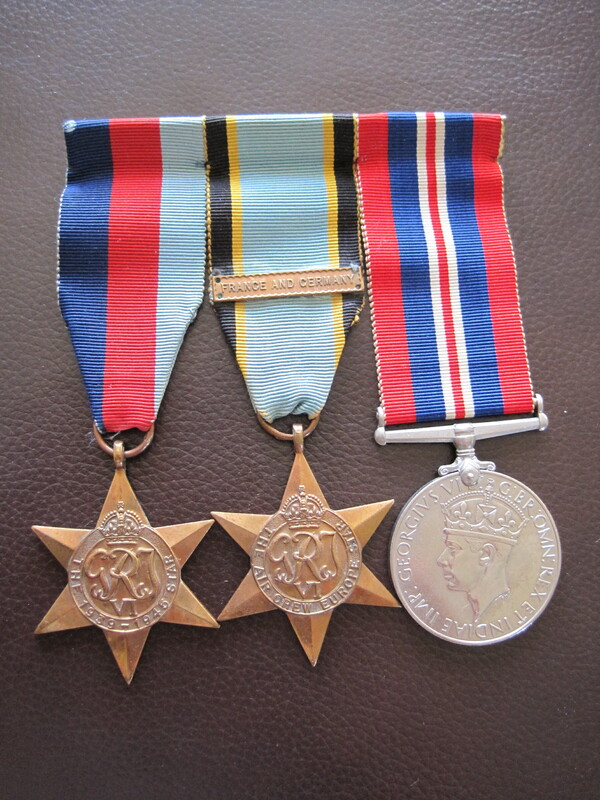 7 of these were Mk.XIIIs, and the other 15, the later Mk.XIII. The final Mossie flight was in ME-Z, the aircraft used by Chris Vlotman on 20/vi/44 when he claimed a Fw190 over Falaise – The last of Vlotman’s 4 victories. The fantastic photo below shows 3 Mosquitos of 488(NZ) Squadron in formation. I think the aircraft furthest from the photographer is ME-Z. Mosquitos of 488(NZ) Squadron flying in formation. 10m off Normandy coast, between Avranches & Le Havre. At 6000ft over cloud. Bright moon & not a thing about. And so almost a year to the day that he arrived at RAF Bradwell Bay to join 488(NZ) Squadron, Broody flies his last Operational Patrol of the tour. Today is also his final flight in “The Mighty E”. In all, Broody has now flown a total of 176 hours 5 minutes on Operations. 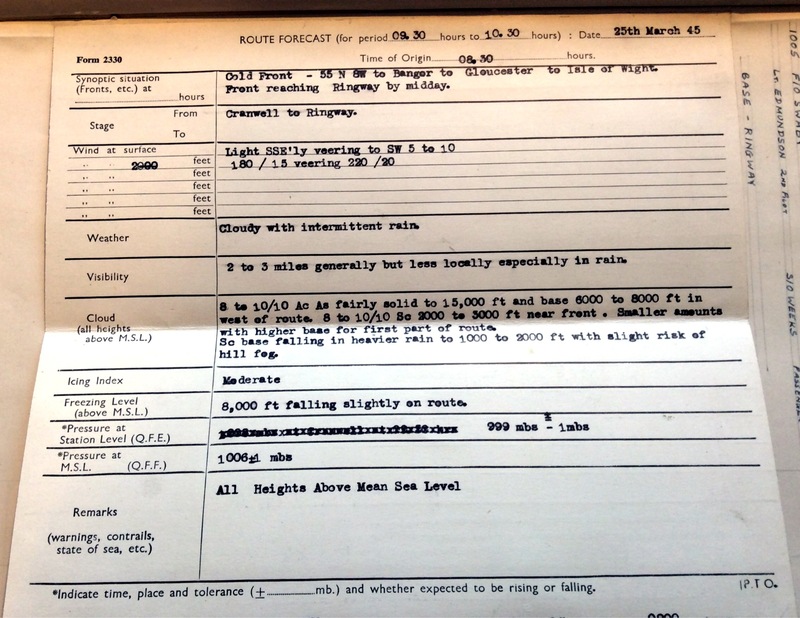 Of these, all were night operations apart from 35 minutes of daytime ops when he was scrambled to search for lost B17 Fortresses of the 8th USAF in January. In that time, although he never had any “success” in destroying an enemy aircraft, the countless bogies discounted as friendly due to his interceptions played a valuable part in the war effort. There were, of course, some hairy moments. He was shot at a number of times (by allied aircraft); suffered mechanical failure; got coned in a German searchlight; and had a near miss with the French coast. There are still a few more entries in the journal, and another month with the Squadron, but the Operational side is over – Broody has survived his war. Camera on Dakotas & practice with S/Ldr Watts, until lost in a cloud. Then target for W/O Green. Training on the new A/I Mk. X system saw an increase in day flying hours for Broody this month – up from 9:10 in July. Night Operational hours were also up by just over 7 hours, which equates to an additional 2 patrols this month. Again, this month was, the most successful to date for the Squadron, with a total of seventeen enemy aircraft destroyed and four damaged. 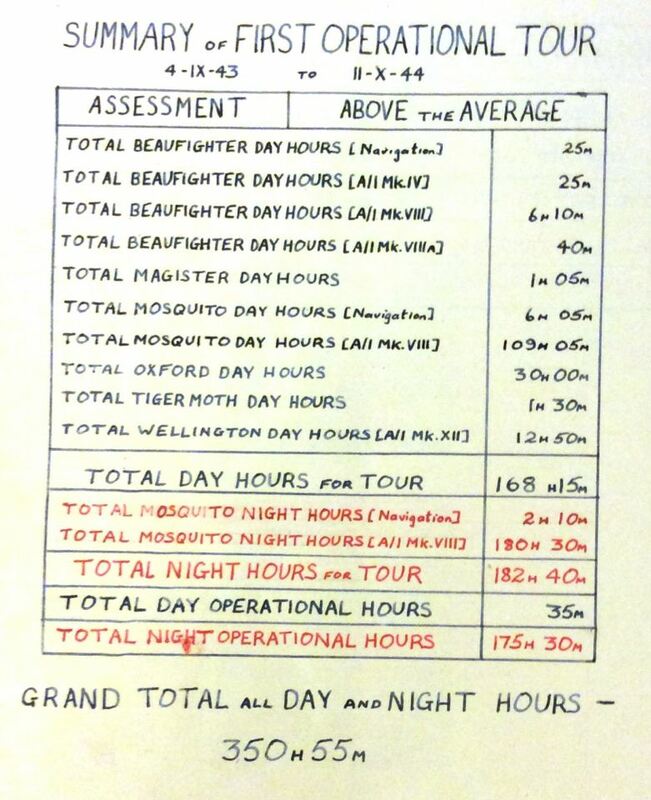 The ORB reports that this tally is just one less than the previous best month (July 1944), and put 488(NZ) Squadron on top of the leader board for 85 Group. 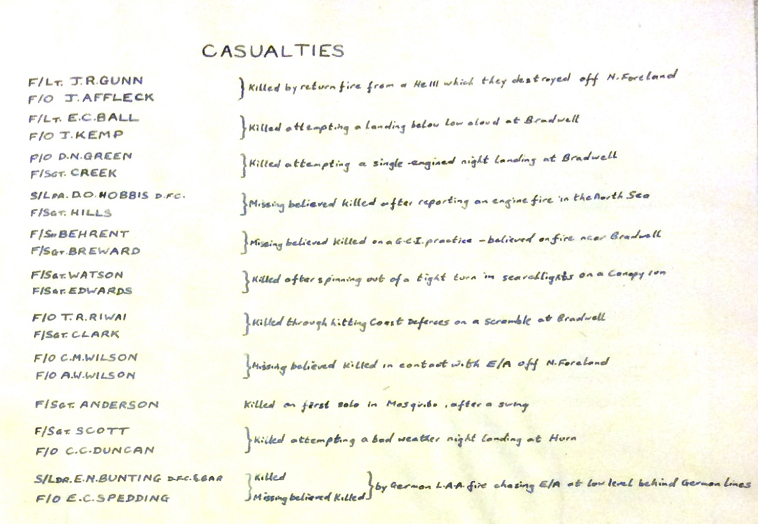 Enemy aircraft were destroyed by the following pilots during the month.